Find information​the developments at Century Park on the their website. The future of park and ride in our City is a sensitive debate. Many people rely on those park and ride facilities to help them transition from suburban areas, where transit is not fully developed, to the core, where LRT and bus routes are more plentiful. The park and ride facility at Century Park has a foot in both camps. The facility is certainly far enough south to be considered suburban, but at the same time, the developer for the site is looking at building 2500-3000 units of housing at some point, making it a prime location for transit-oriented development and density. ​ The answer to the Century Park problem has two parts; one part specific to the site itself, and the other a more macro solution. 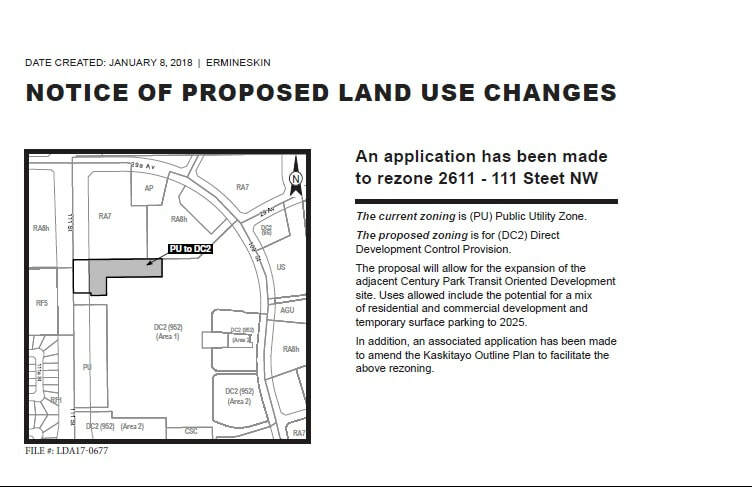 The first part is that Century Park needs to be both a TOD site and also has to provide service to Edmonton’s more outlying neighbourhoods, just by virtue of location. The City does own a portion of the site at Century Park - enough for around 300 parking spaces, which will help to meet a demand that will persist after the City’s lease on the land expires in 2020. The second part involves the development of an Edmonton-specific Park and Ride strategy. This will be coming as a part of the City’s current Transit Strategy Review project. We need to have a holistic understanding of the ecosystem of LRT users throughout the City, one that allows us to plan with a realistic sense of current behaviours and how much change, and what kind, the system can tolerate. I’ve been asking our Administration to investigate our options to maintain some amount of park and ride and to increase the capacity of our transit system. The following motions went forward at Transportation Committee in August, and the reports will be coming back in the next few months. * A report on an enhanced express bus strategy between neighbouring communities and Century Park LRT, and between the future Heritage Valley Park and Ride and Century Park. *Administration to work with regional partners to provide a report on a cost-sharing strategy for the Heritage Valley Park and Ride. ​* A report with potential options to develop a mixed use residential/public parking facility on the City-owned land on the northwest corner of the Century Park site.